Yesterday, a little favorite monkey swung into a new DVD and it is a fun one! Spring has sprung and the world’s favorite monkey returns — as curious as ever — in this high-flying, full-length feature. You know it must be springtime if a curious monkey named George is dancing on the balcony at sunrise! George is so excited about Spring that he wants Hundley to have Spring Fever too. But even blooming flowers, baby animals and canoe rides cannot make Hundley love Spring. Even worse, Hundley gets lost in the country. Searching for his lost friend, George accidentally launches the hot air balloon rally and sails over the countryside. Luckily he manages to grab Hundley from a hilltop along the way. Together they return triumphantly to the city. The Man with the Yellow Hat, the Doorman and Lydia stage a daring rooftop balloon rescue. Not only are George and Hundley saved, but they manage to win the coveted Spring Building Prize! Finally, to George's delight, now Hundley has Spring Fever too! 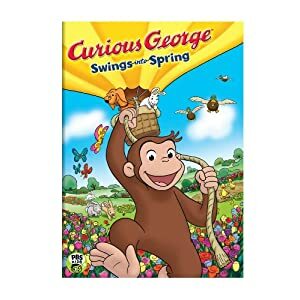 Win It: (1) Curious George Swings into Spring DVD to a lucky winner! My son would love this. Thank You so much for the chance to win.